With this release Rig-Mapping for all hair models is changed. All new models that have been created with LOD meshes change their prefix to FGC in FG3D. The Local Path is renamed FG3D. Eight different hair models with Albedo, Specular and Normal Map. 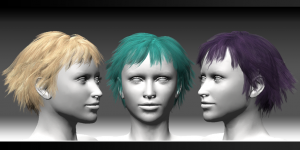 Each hair model has up to three different materials; this feature, if on the one hand increases the maps to manage, allows interesting mix of colors. 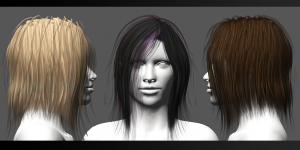 Many blendshapes available, allow you to have different styles and are essential to adapt the hair models to 3d-characters and the various available prop. Available colors: black, blonde, brown, carrot, grey, platinum, red. Available colors: aubergine black, blonde, blonde light, brown, platinum, red. Available colors: black, blonde, brown, red. Available colors: black, blonde, brown, grey, platinum, purple, red. Available colors: black, blonde, brown, purple, red. Available colors: aubergine black, blonde, blonde dark, brown, platinum. Available colors: black, blonde, brown, grey, red, rust. Available colors: black, blonde, brown, grey purple, red.